The old joke on blogging is that nobody cares what you had for breakfast, but what if I don't care that nobody cares? I took this photo so that a decade from now, I'll remember how great it was to work from home three days a week...and a reminder of how awesome Tannis is (baking muffins, then delivering these goodies with coffee upstairs). I really do not deserve such treatment. We celebrated Tan's birthday this week by going out to Joey's in Kelowna, then hitting the Value Village in our old 'hood, which isn't very romantic, but you gotta take these chances to browse without kids dragging you toward the gross used toys. Then back to my folks' place to devour cake and pick up the kids. A top-notch Monday night -- Happy Birthday, babe. Happy b-day Tannis! What a deluxe breakfast! It looks like something you'd get at a gourmet restaurant. I also thought the presentation was impressive. Happy Birthday Tan! I miss fresh muffins, forgot about that concept. But I especially miss dates at Value Village. I thought it was romantic! It took me back to our old grunge days and being in the old 'hood reminded me of the first um...7 years we were married. Almost 10 isn't it?! You're welcome for the muffins, it's fun to deliver treats on occasion. We should probably emphasize to the devoted readers that you took a picture due to the rarity of the event, this is not a common occurence! 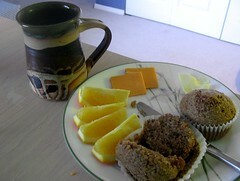 Well, I do get coffee delivered pretty regularly, but not often fresh muffins.